It’s that time of year when ghosts and goblins are out in droves, children in costume roam the streets at dusk on a noble quest for candy, and unsuspecting passersby fall victim to the random acts of mischief that plague so many on Halloween. It is not a night for the faint of heart. You never know what you will experience; perhaps a candlelit jack-o-lantern will be the only light guiding you down a spooky, dark street, its devilish grin following every step you take. 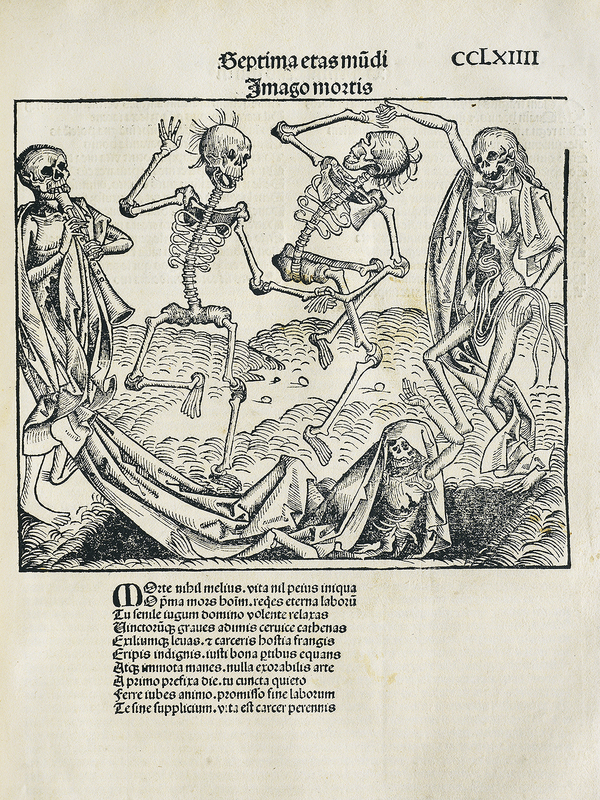 Even worse, you may follow the sounds of music and laughter, and stumble upon a band of skeletons rising from the dead to perform the Dance of Death, as depicted in this 15th century woodcut illustration, The Seventh Age of the World: The Image of Death from Liber chronicarum (Nuremberg Chronicle) written by Hartmann Schedel and illustrated by Michael Wolgemut in 1493. —This verse was adapted from Petrarch’s “Letter to Giovanni Colonna” (“Epistola ad Ioannem de Columna”). Translation by Michael North. This best-selling secular book of the 15th century chronicles the history of the world in seven ages, from its creation to its final days. The ghoulish jamboree above, one of over 1,000 illustrations that appear in the book, certainly leaves a lasting, hair-raising impression. So proceed with caution on this special day. If you hear sounds of the undead doing the Dance of Death, turn the other way, and have a safe and Happy Halloween.